If you were composing a dictionary entry for "messy tree," you might very well insert a picture of an eastern white pine tree to serve as an example. Ironically, it would serve just as well as an example of a graceful, magnificent specimen plant. These facts present something of a dilemma to the homeowner seeking a visually appealing yet low-maintenance landscape. A gymnosperm (as opposed to an angiosperm) bears seeds that are unprotected, rather than being enclosed in ovaries or fruits. The term comes from the Greek for "naked seed." As different as they look from Eastern white pine trees, Ginkgo biloba trees are also gymnosperms. While the West Coast has taller trees, eastern white pine is the biggest conifer native to eastern North America. It is commonly found as far north as Newfoundland and as far south as northern Georgia, a span covering growing zones 3 to 8. This behemoth can grow to be as tall as 80 feet and as wide as 40 feet. 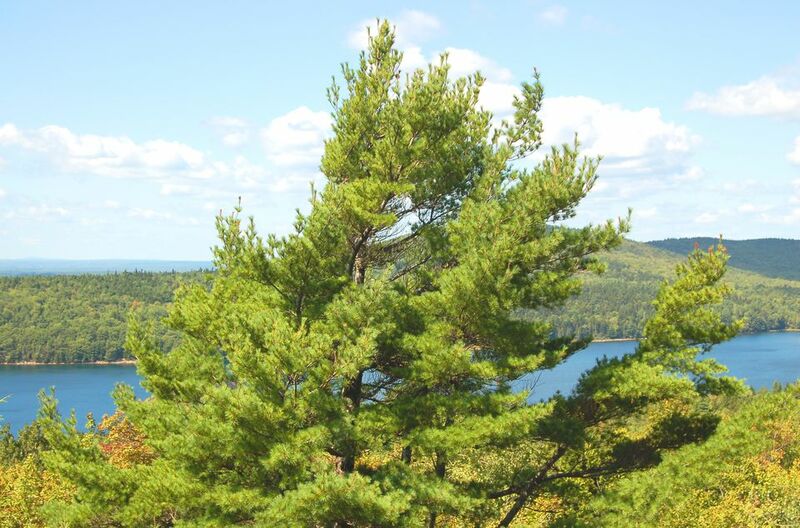 Eastern white pine is the only pine tree in the East that bears five needles to a bundle. These bundles form clusters that look like little brushes. The tree's cones are cylindrical and are the largest pine cones found in many areas of the tree's range (the New England states, for example), reaching as much as 6 inches long. By comparison, the pine cones of a pitch pine (​Pinus rigida) measure only about 3 1/2 inches long. Even lovers of evergreens have good reason to be down on Eastern white pines, especially Northerners. Whenever they get a bad ice storm or wet, heavy snowfall, they are reminded of the drawback of having large evergreen trees with brittle branches around. Large Eastern white pine trees just don't mix well, in the wintertime, with wires, driveways, and houses. When dumped upon with heavy loads of snow or ice, their evergreen foliage holds an enormous amount of the frozen precipitation — too much for their relatively weak limbs to bear. The result is that the limbs come crashing down, taking out whatever's under them. Nor is their messiness restricted to winter damage. You have to rake up the cones (which are very slow to decompose) in fall, adding to your leaf-removal chores, and the fallen needles insert themselves in the darnedest places. Furthermore, in spring, the pollen gets all over car windshields, and the pitch (sap) makes an even bigger mess. You can remove pitch from a windshield using a solvent (such as nail polish remover, mineral spirits, or rubbing alcohol), a rag, and a single-edge razor blade. Eastern white pine also have a lot of great features. They are large, fast-growing, and have a graceful figure. They make excellent windbreaks and shade trees and can be clipped into hedges. Their branches are also prized for crafts and decorations; the boughs are commonly employed in outdoor Christmas decorations using greenery. The pine cones, as well, come in handy in creating decorations, once you learn how to wire the cones. While Pinus strobus is hardly a conventional hedge plant, it can be used effectively in this capacity. If you live in a rural area and have lots of Pinus strobus saplings on your property, they can easily be turned into a free hedge (as opposed to going to the nursery and buying shrubs). Dig them up while they're still young and plant them in a row, as you would any hedge. Then, head them back regularly to keep their growth in check. Should You Grow Eastern White Pine Trees? Given their benefits and potential uses, you shouldn't necessarily let the messiness of these trees scare you off. If you do want to plant them, make sure you have the room, and place the trees where falling branches (and even sap) won't be a significant problem. For example, you don't want their limbs hanging out over your house, car, power lines, or outdoor activity area. Growing them out in the open or along a property boundary is a safer option. Alternatively if you love the look of pines but have a small yard, it makes more sense to grow a dwarf variety, such as a Japanese dwarf pine tree.